Lisinopril is a prescription medication for lowering high blood pressure and improving symptoms of congestive heart failure. 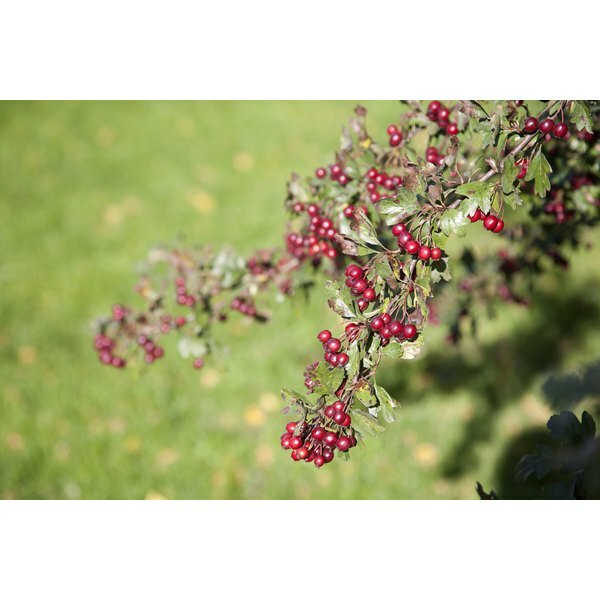 Hawthorn berries, leaves and flowers have a role in herbal medicine for treating these same conditions. If you take lisinopril, consult your doctor before adding hawthorn berries or other components of hawthorn to your health regimen. Research confirms that hawthorn significantly improves heart function in people with congestive heart failure, according to the University of Maryland Medical Center. Early research also indicates that hawthorn may be helpful for angina. The primary active components are flavonoids, which are plant chemicals with health benefits. While people traditionally consumed hawthorn berries for cardiovascular conditions, most modern herbal preparations add or only use the leaves and flowers. Hawthorn leaves and flowers may contain more of the flavonoids than hawthorn berries do, but some studies have found effectiveness for preparations that contain all three components, reports the University of Maryland Medical Center. A study published in the June 2006 issue of the "British Journal of General Practice" notes that herbal practitioners in the United Kingdom use hawthorn berries, leaves and flowers to treat high blood pressure in patients also taking prescribed medication. Small clinical studies support this use for hawthorn, according to the researchers. Lisinopril is classified as an angiotensin-converting enzyme inhibitor, commonly called an ACE inhibitor. It widens blood vessels by reducing the levels of chemicals that tighten blood vessels. This allows blood to flow more easily and the heart to pump blood more efficiently. Drugs.com does not list an interaction between lisinopril and hawthorn, and says there are no known interactions between hawthorn and any drug. If you'd like to try hawthorn berries or the leaves and flowers as a complementary therapy with lisinopril, talk with your doctor first. Hawthorn as a medicinal herb is considered safe, according to the University of Maryland Medical Center. Side effects are uncommon, although some people have experienced headaches, nausea and heart palpitations. The "British Journal of General Practice" study states that herbal practitioners do not restrict long-term use of hawthorn for cardiovascular dysfunction.